Writing with unusual candor, Lee draws upon his own journey from atheism to Christianity to explore the depth and breadth of God's redeeming love for spiritually wayward people. He travels thousands of miles to capture the inspiring stories of everyday people whose values have been radically changed and who have discovered the "how" and "why" behind God's amazing grace. Through it all, you will be encouraged as you see how God's grace can revolutionize your eternity and relationships ... starting today. 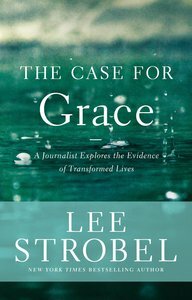 About "The Case For Grace"